Back on da road again after stopping to watch the fisherman for a bit. 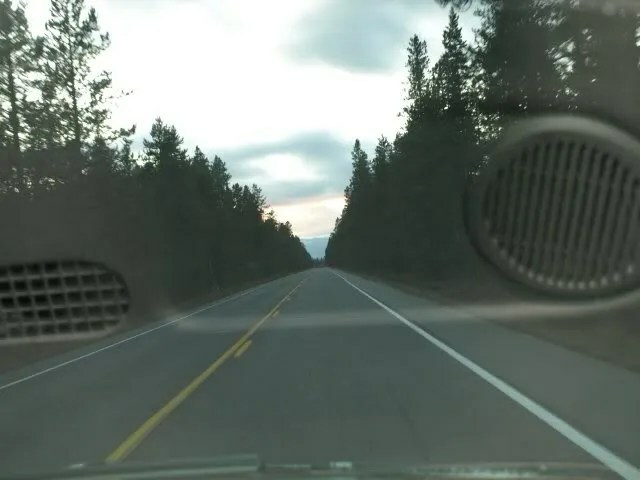 This part of the trip marks the end of our time in Yellowstone, and I must admit I was feeling kinda wai maka about the whole thing. Our trip through was so wonderful but I longed for more time to explore this stunningly beautiful area of the world. 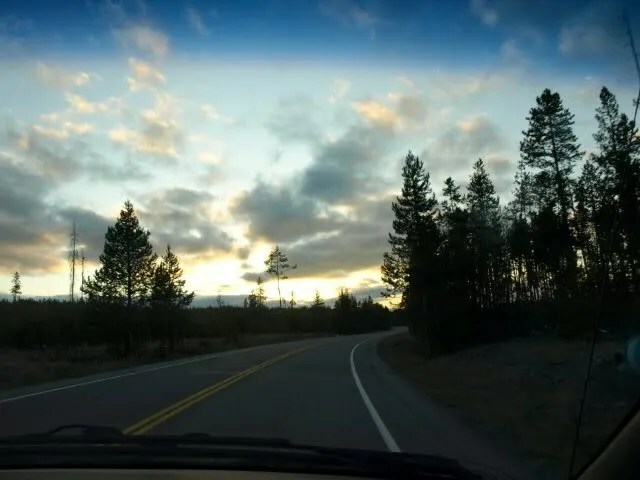 Doing this road trip has been good for me, because I have the chance to re-live the wonderful memories we made there. I know we’ll be back! 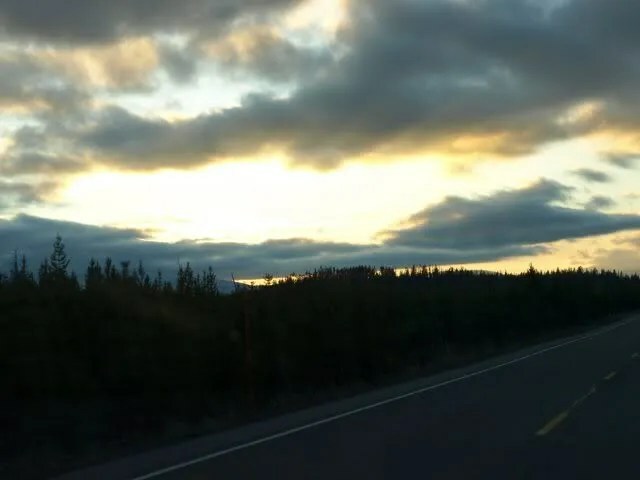 We were still heading West and the sun was starting to go down. 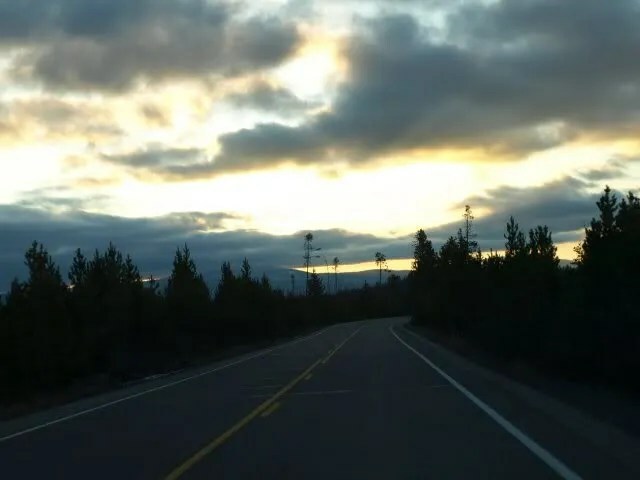 It had been a very long day, we still had a ways to go, but we could still enjoy the twilight hours as we drove along. We’d spent a good part of the day in Wyoming, and now we were back in Montana again. It felt good. 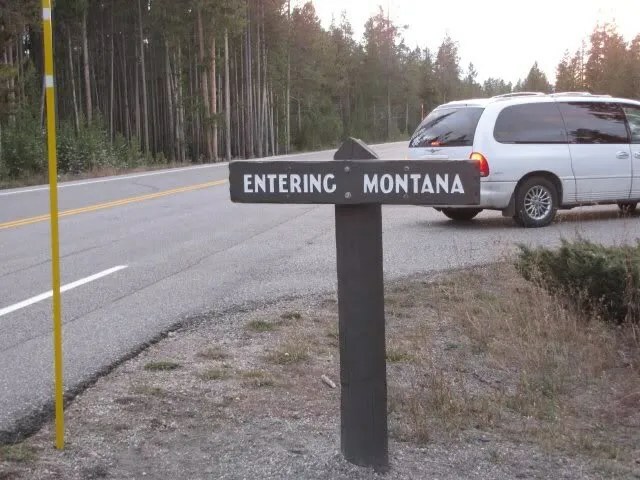 I love Montana! 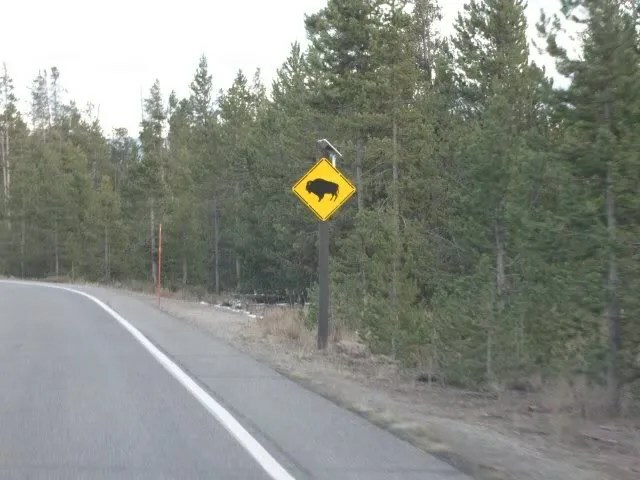 We still had to watch out for bison as we drove along. We didn’t see any; I was hoping to, but I guess they were all settling down for the night. It was now 6:53 p.m. and getting hard to take photos with all the trees and shade around. But ho! 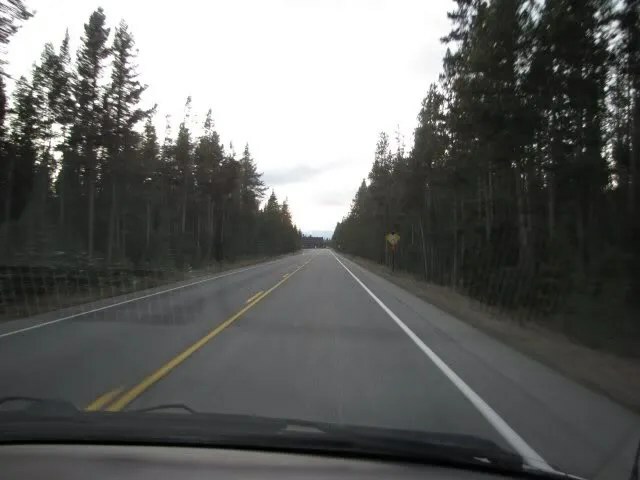 What is that up ahead? Do we really want to know? Oh no! 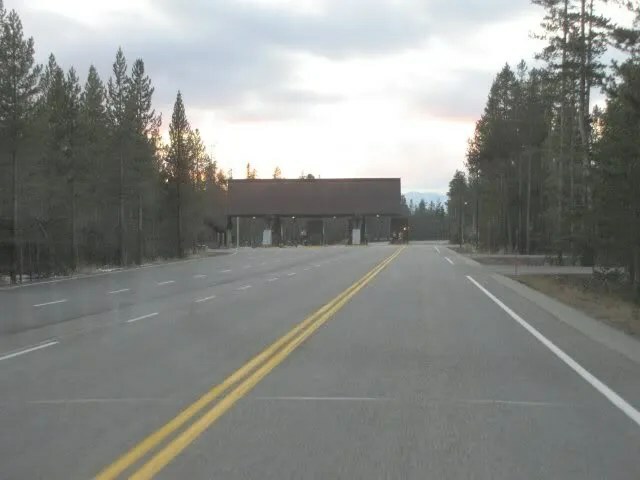 It’s the Yellowstone entrance/exit gate! We’re really leaving this incredible place! Wa-a-a-a-a-a-h-h-h-h-h-h! Get out the Kleenex. We paused for a moment before driving through, thanking ke Akua that we’d been able to have this wonderful day of adventures. Bison, rivers, elk, Hayden Valley, sulfer springs, hot springs, Old Faithful, and incredible scenery. 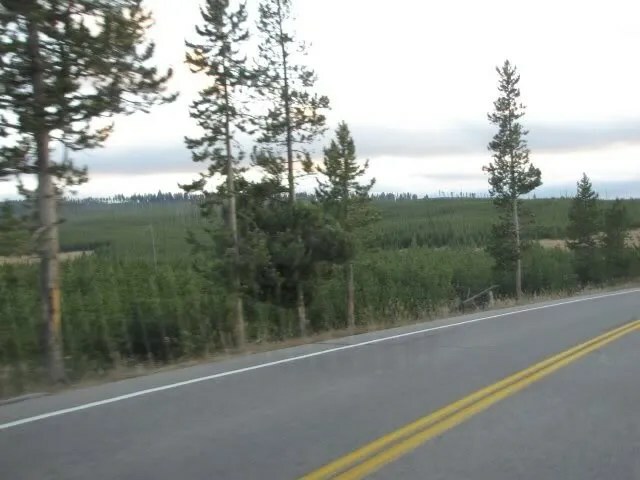 We felt very grateful for the road construction that forced us to head on a route that enabled us to experience so much of Yellowstone. Then we passed through the gate, and it was behind us. Aloha ‘oe ‘o Yellowstone… we’ll be back! The sun was going down, and Nolemana got some really pretty sky photos as we drove along. …and soon it was gone. 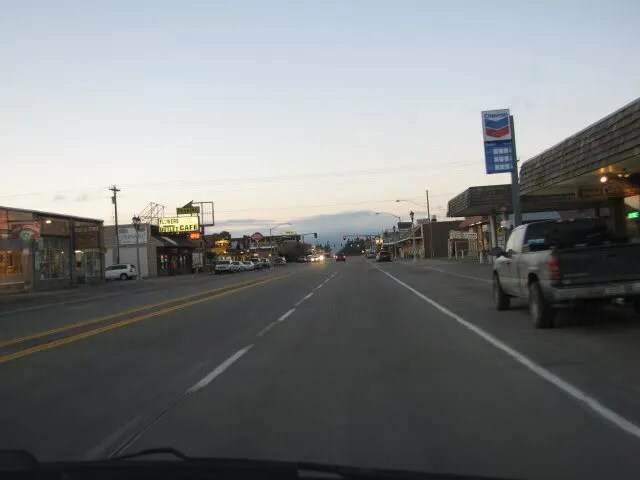 Before too long we entered the town of West Yellowstone. It would’ve been fun to explore here, too. But it was much to late. We really began to feel the long day’s drive. The sun had just set behind the hills. 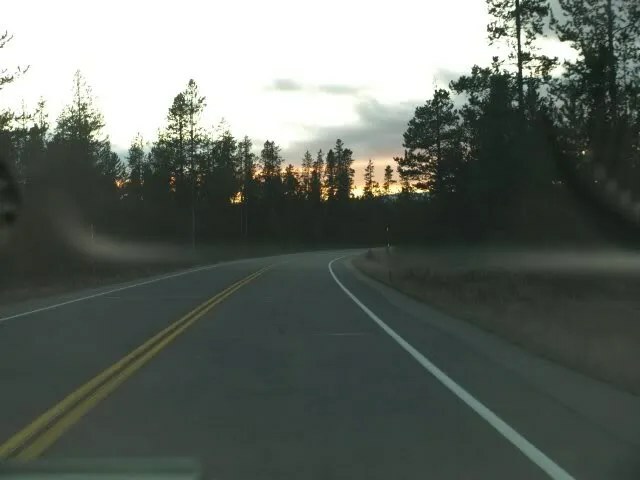 Back on the open road again; it was now about 7 p.m.
Once out of the trees we had some light left, but not much! Our photos were going to have to come to an end pretty quick. 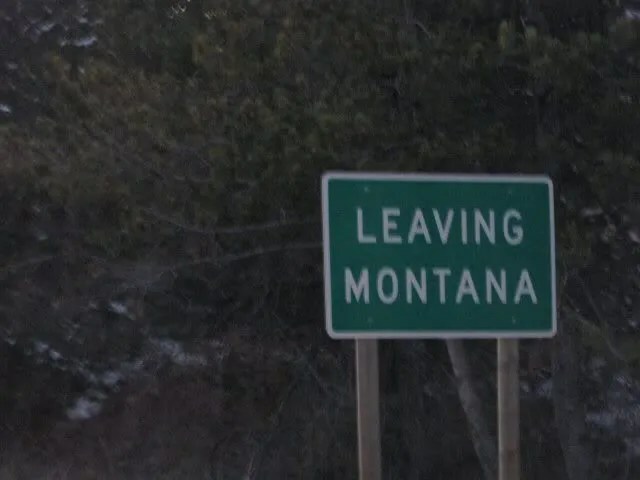 Now we came to another sad place… leaving Montana. We had no idea how long it’d be before we’d be back. I definitely felt teary. 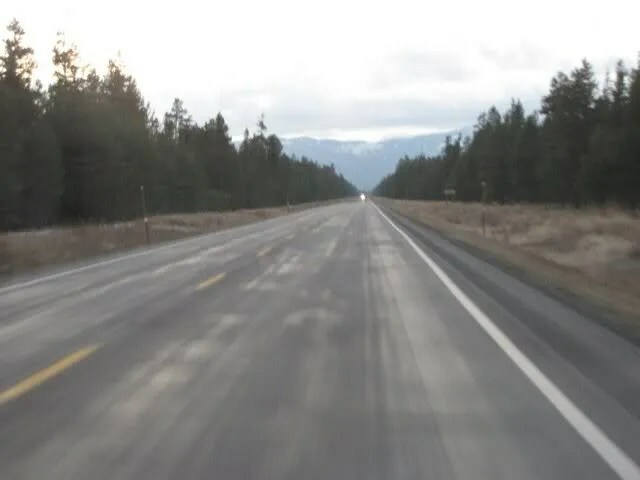 And just a second later, we were in Idaho, back at the Continental Divide. And still really high up. Try look the snow still on the ground. And if you can see it, on TryLook our kauila is straddling the State Line! We’re now in the Madison Valley, and are about to turn South. 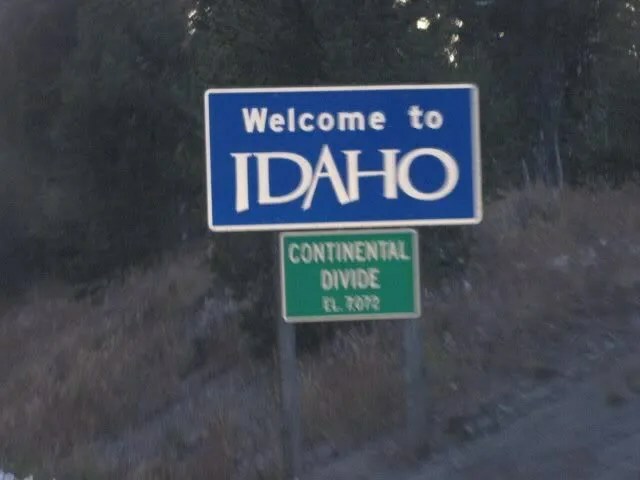 It’s been many, many years, too many, since we’ve been in Idaho. By now it was dark, and the tiredness really settled in on us. We hadn’t had anything to eat since about 1 p.m., which seemed like an awfully long time. Well, it was, really. 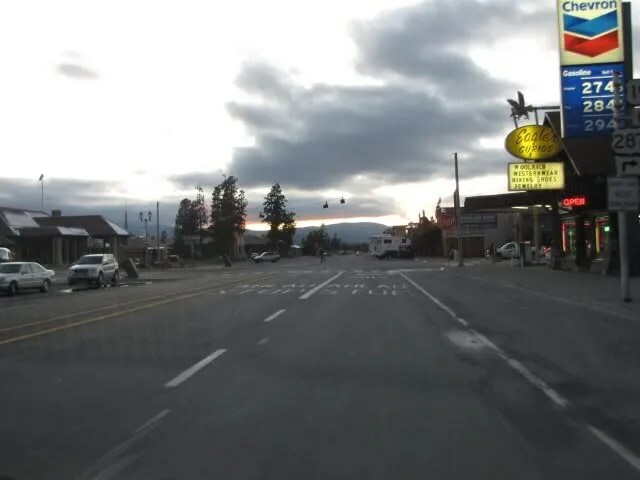 ‘Way back in Gardiner, Montana. The day almost felt like a dream, like did we really do all this in just one day? 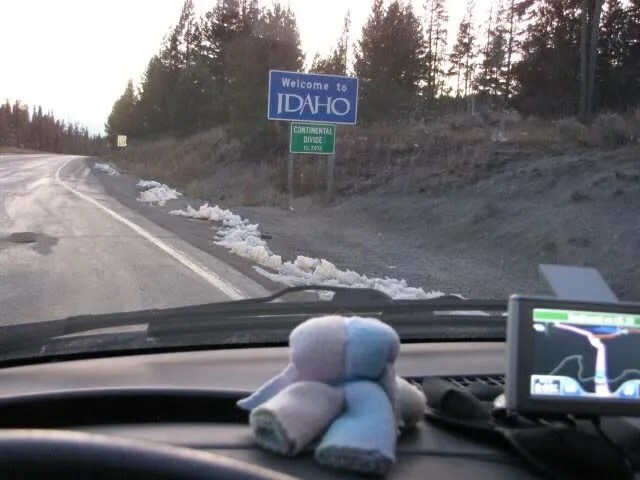 Go from Bozeman, all the way through Yellowstone, and now we’re in Idaho? It didn’t seem possible, but our bodies sure felt it! 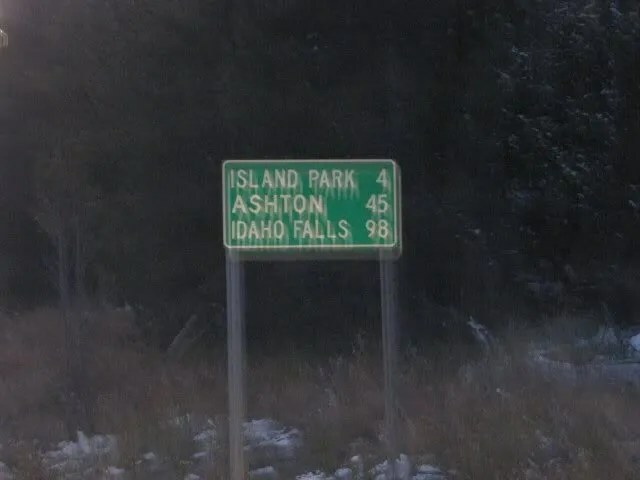 We drove through the Targhee National Forest, passing through Island Park, Ashton, Chester, St Anthony, Rexburg, Rigby, and finally came to Idaho Falls, where we decided we couldn’t wait any longer to eat. It was about 8:40 p.m. and we were afraid that pretty soon nothing would be open. 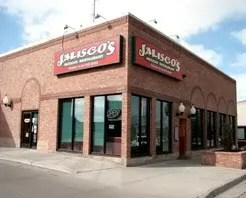 We pulled into Jalisco’s Mexican Restaurant, tired and hungry, relieved that it was open till 9:00, and not really caring what we ate. We pretty much fell into a booth. The food came quickly, and was really, really, good! I had chicken in a fabulous cream sauce that right now I can’t remember the name of even though I always order it. Pollo crema? Whatever it was, I loved it. I can’t remember what Nolemana had and neither can he. Probably enchiladas. The portions were so big we threw the rest in our ice chest. We didn’t get a photo, but here’s one from the web. Pau eat, we drove south for about thirty minutes till we got to our motel in Blackfoot, Idaho. Oh man, were we tired! I’d already made reservations at the Best Western there, so check-in was a snap. We fed Kukui, took showers, and fell into bed, exhausted. It had been an incredible day, and now we were ready to sleep! Our trip isn’t over yet! We still have more adventures to share on our way back home. I hope you’ll stay with us. 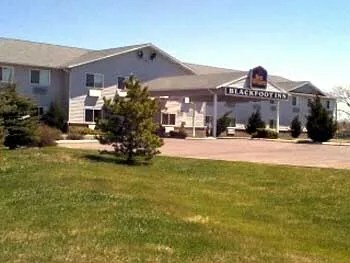 Best Western, Blackfoot, Idaho. Really nice place to stay if you’re ever in the area. And here’s where we’ve been so far! 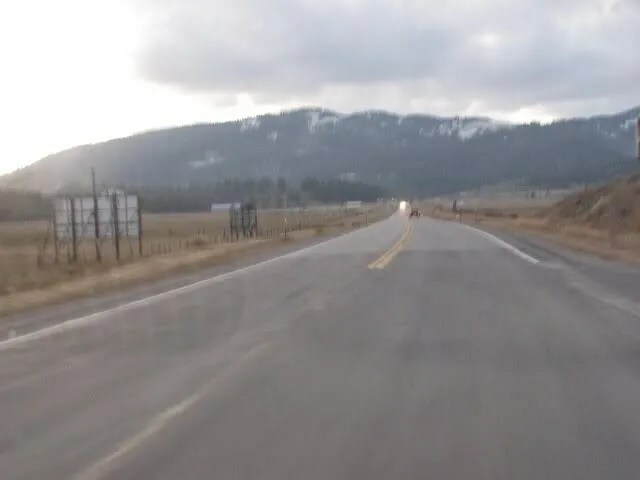 Check out how far we went just today, starting in Bozeman! Thank you, arigato gozaimasu, mahalo nui for all your time and effort to take us along for the ride. I must say that I enjoyed every hill, every curve, and all the sights you shared. Your photography and your stories made the trip a truly wonderful adventure seeing it all through your eyes. Thank you. 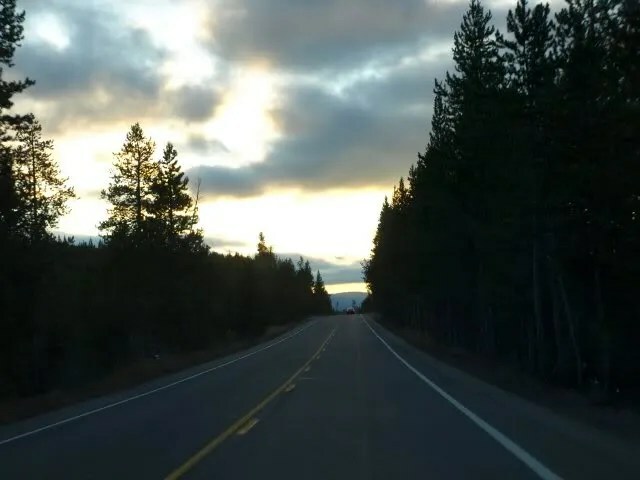 And yes, it does feel kind of sad that it is over, but we all know that the adventure is out there for anyone who cares to go, and if I do make the trip someday it would only be because you’ve inspired me to go and see the wonders of this beautiful, free country we are so blessed to call home. I’ve been to so many countries over the course of my life, and from my experience, I have learned that “there is no place like home!” Your stories and pictures has captured the reasons why I say that. Wow, beautiful photos. I know, sad coming home sometimes, yah? But the best trips are those where you’re happy to leave then happy to come home again. I love Island Park! (Can’t wait to take my boys there.) Love the pics of the sun setting, so nani! Mahalo for sharing!